In Northern Arizona, within sacred Navajo Territory, exists one of the most breathtaking sights the American Southwest has to offer. With layers of beautifully contrasting sandstone creating an otherworldly feel, Antelope Canyon is easily one of the most enchanting places on the continent. On the way out to this jaw dropping slot canyon, the drive is accompanied by captivating views of the Vermilion Cliffs and the dreamlike shore of Lake Powell. 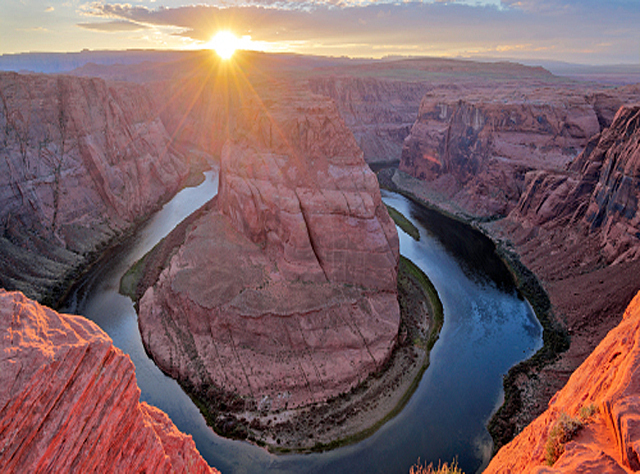 Antelope Canyon, formed by a millennia of floods is not the only natural marvel visitors get to see on this tour: Horseshoe Bend, the Colorado River’s most famous hairpin turn, was created under similar conditions as the Grand Canyon, equally formed by sediment and debris carrying waters. On our full day Antelope Canyon tours from Las Vegas, guests enjoy continental breakfast to-go, a picnic-style lunch and unlimited bottled water to help them along on this journey! ·	Tour the world’s most famous slot canyon, a surreal, narrow subterranean passageway of sandstone formed by centuries of seasonal flood waters ·	Navajo guide in Antelope Canyon to learn about Native culture and geology of this amazing region ·	Enjoy overlook views of Horseshoe Bend, the most captivating curve the Colorado River has carved out ·	Scenic, drive-by views of Lake Powell ·	Departs Las Vegas at approximately 5:00am and returns to Las Vegas at approximately 8:00pm ·	Includes continental breakfast, picnic lunch, snack, entry fees, bottled water. ·	This tour requires a reasonable level of fitness to participate. Stairs, ladders and loose sand will be present on the tour. The Antelope Canyon Tours depart from Las Vegas Sundays, Tuesdays, and Fridays between 4:30am and 5:00am and returns between 8:00pm and 8:30pm. This is a full day excursion, lasting approximately 15 hours, hotel to hotel. Guests chose for the following wrap option for lunch – Turkey & Cheddar, Ham & Swiss, Club – Turkey, Ham, Roast Beef & Provolone, Veggie – grilled seasonal veggies. NOTE: We can accommodate requests for gluten free and dairy free lunches. Please be sure to notify us at time of booking.